The 2017 Providence Tree Tally has now been completed! Volunteers and community groups from around the city joined Mayor Jorge Elorza and the Dept. 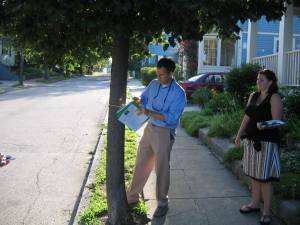 of Parks and Recreation to count and measure every street tree in Providence. STAY TUNED FOR THE RESULTS OF THE INVENTORY! City trees make our neighborhoods cleaner, healthier, and better places to live and work. They absorb and capture air pollutants, lower summer temperatures, intercept stormwater, and offer beauty to soften the edges of our built environment. In short, trees improve public health. Why Do a Tree Inventory? In order to manage our city trees efficiently and strategically, we need to know some crucial information: how many trees we have, along with each tree’s species, location, size, and condition. The previous tree inventory was completed in 2006, but the information has become outdated. It was necessary to complete another comprehensive survey in order to help us with the work we do every day, and to plan for the future. During the summer and fall of 2017, committed volunteers and community groups counted and recorded information on every one of the city’s approximately 27,400 street trees. The inventory began with volunteer training in late June, and continued through October. Volunteers (as pairs or individuals) were asked to attend one indoor and one outdoor training session and were assigned one inventory zone containing about 250 trees – an estimated 35-hour commitment over 4 months. Does this sound interesting to you? We are now working on an inventory of trees in Providence’s City Parks! Contact us at (401) 680-7254 to find out how to get involved in Providence’s Urban Forest, or visit www.pnpp.org.